By Bruce Allen, Patriots Daily Staff. The Bills scored their biggest win since (fill in the blank). 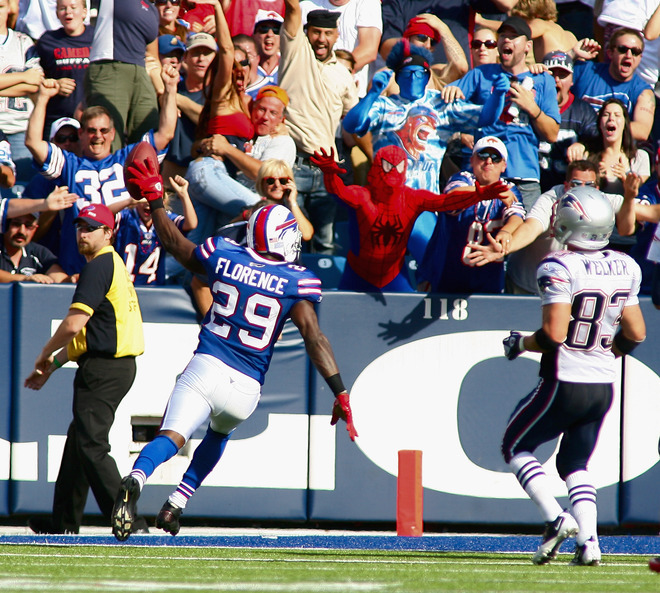 The Bills stormed back to beat the Patriots 34-31 at Ralph Wilson Stadium yesterday afternoon. It was a win that prompted cheering in the press box from the Buffalo media, and apparently even a little trash talk aimed at their New England colleagues. Buffalo Rumblings credits the Bills’ secondary with a huge bounce-back from last week and gives Fred Jackson the game ball for the week.The win vaults the Bills to first place in the AFC East, and they are now the only unbeaten team in the entire conference. The Bills look to move to 4-0 next week as they travel to Cincinnati to take on the 1-2 Bengals. The Jets have another test this week as they travel to Baltimore to take on the Ravens on Sunday Night Football. Is the Patriots defense as bad as it looks? After three weeks, you’ll find them at the bottom of most league categories. Can they improve? At this point, it doesn’t appear there is anywhere to go but up. Injuries have been a factor, but certainly not an excuse. Would things have been different yesterday with a full squad? That’s hard to say. Of course the Suzy Sunshines of the world (that would be me) will point out that it’s how you play in December and January, not September that counts. If the defense is still surrendering 400+ yards and 30 points a game in weeks 12-16, we’ll panic then. The Patriots travel out to Oakland to take on those same Raiders next week, with a chance to pick up a “common opponent” game on the Jets. Things are not looking good for the Tony Sparano era in Miami. Rumors had the coach needing to win either yesterday or this coming week in order to keep his job, and yesterday resulted in a 17-16 loss on the road to the Cleveland Browns. The Phinsider says that the Dolphins had every chance to win this game. The defense played OK, but then let Colt McCoy have his way on the final Browns drive. The Dolphins rough start has the fandom apparently dealing with an issue that we’ve seen once or twice here in Boston as well – You don’t have the right to tell me, or anybody else, how to be a fan. It does not get easier for the Dolphins this week as they head out San Diego for a meeting with the Chargers, with Miami still looking for that first win of the season, and to possibly save Sparano’s job. I can’t take this team seriously at all with this historically bad defense. Even if they shave 100 yards per game off their average, that assumes Brady and the Offense continues to be prolific. But you saw what happens when Brady isn’t near perfect; the Defense can’t make situational stops. At all. If they held Buffalo even ONCE in the 4th quarter, they escape with a win.